In July 2018, I experienced the joy of taking my two sons and my parents on our very first Disney cruise. My parents and I have cruised many times before, but this was the first for my kids. 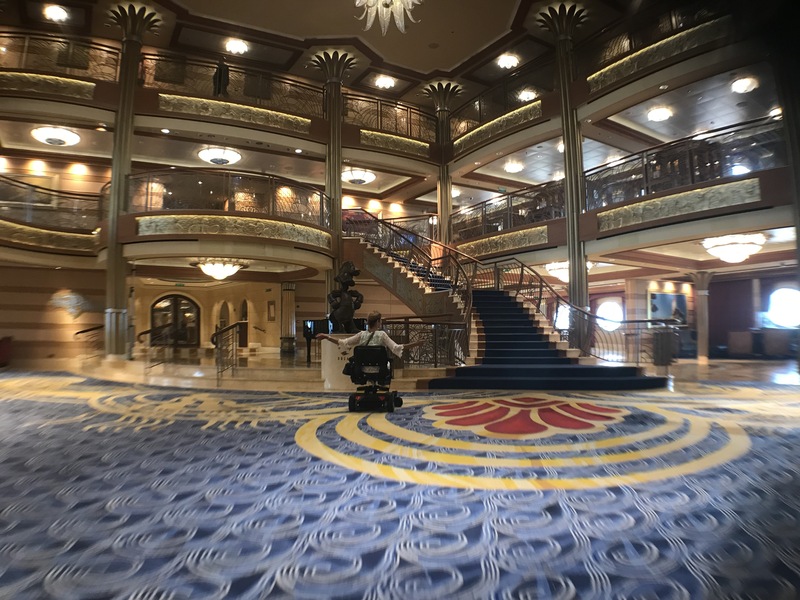 This was also my first time on Disney Cruise Lines, and my expectations were set very high based on everything I had heard from frequent Disney cruisers – as well as everything I know about Disney’s attention to detail when it comes to wheelchair accessibility. For this trip, I chose a 4-day itinerary on the Disney Dream out of Port Canaveral, Florida that would take us to Nassau and Disney’s private island, Castaway Cay, both in the Bahamas. 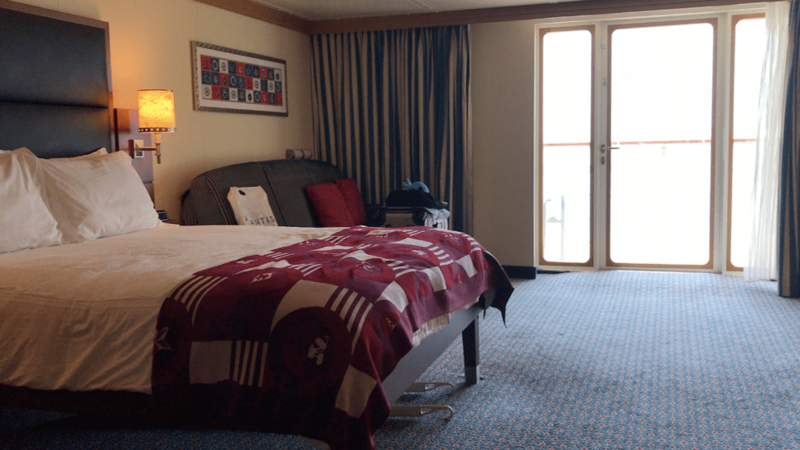 Here’s my overview of the wheelchair accessibility and overall experience on the Disney Dream. 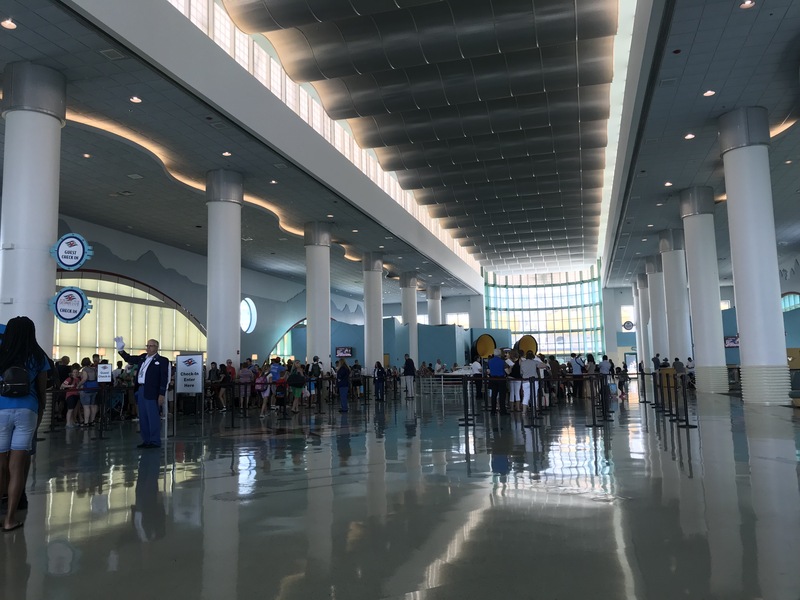 At Port Canaveral, Disney Cruise Lines has its own terminal and parking garage. After entering the terminal and going through security, we waited in line for no more than ten minutes to reach the check-in desk, where we has our security photos taken and were issued our Keys to the World. These key cards have to be used every time you get on or off the ship, to get into your stateroom, and to purchase anything on board. I recommend wearing these on a lanyard so you don’t lose them, or have to go digging for it throughout the day. After getting our cards, it was time to board the Dream! We went through a little Mickey Mouse-shaped tunnel and rolled up the ramp onto the gangway. The metal arch that bridges the ship and the terminal gangway is quite steep, but there are crew members nearby to help you get over it. From there, you will enter the Dream’s beautiful atrium on deck three. At the end of your cruise, you have to be out of your stateroom no later than 8:00AM and off the ship no later than 9:15AM. You can eat at a seated breakfast in one of the dining rooms at either the 6:45AM or 8:00AM seating, or at the buffet in Cabanas. For disembarking, you can either leave the ship with all your luggage at 7:45AM or once you’re given the all-clear around 8:00AM. You don’t have to meet or wait in a particular part of the ship; you simply disembark the same way you boarded, but in reverse. You will collect your baggage in your designated area based on the tags left in your stateroom the night before, then go through US Customs and Immigration before exiting the terminal. Since there were five of us traveling together, I selected an accessible deluxe family stateroom with a verandah, Cabin #8090. The cabin was extremely spacious, with a queen-sized bed, a sofa that converts into a twin bed, a bunk bed that comes out of the ceiling, and a murphy-style twin bed that pulls down from the wall. There are two closets with clothing racks that pull down and a long dresser with six drawers, a lower cabinet, upper cabinet and shelves, and a small refrigerator. There is a no-threshold entry to both the wide balcony and the bathroom. The bathroom was very spacious, with a roll-under sink, a wide fold-down wooden bench in the roll-in shower, and grab bars along all the walls, including a fold-down bar between the shower and the toilet. My only complaint about the stateroom is that the queen bed I shared with my mom was too high for me to self-transfer; I would estimate it was about 31″ high. However, there was plenty of space underneath for the use of a hoist/lift. I couldn’t see any way to lower the bed since it was on wooden legs. I did bring this to the attention of the accessibility director on board the ship. 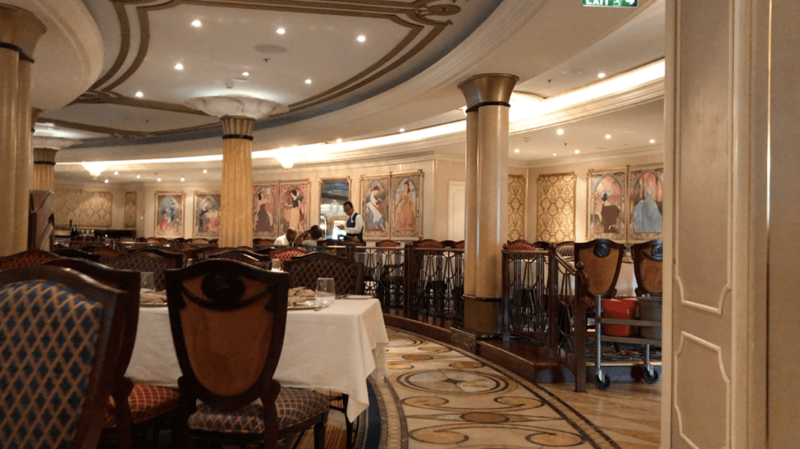 There are three main dining rooms on the Disney Dream: Animator’s Palette, Enchanted Garden, and Royal Palace. You will rotate through each restaurant, with the order and table listed on your Key to the World. Your wait staff will also rotate with you. The Animator’s Palette looks like a huge Mickey-themed art studio, with drawings all over the walls, sculptures of Disney characters, and screens that show animated clips of Finding Nemo characters throughout the meal. It’s the most casual of the three restaurants, as well as the loudest and most lively. Enchanted Garden looks like a beautiful light green-and-white greenhouse, and has the least amount of space for maneuvering and seating of the three restaurants. Royal Palace is the most formal-looking with a castle-type theme. There is ample space for maneuvering and seating here. My family and I found the food to be outstanding. Before every meal, we were asked if anyone had any food allergies or sensitivities. Before we arrived each night for dinner, a chair was already removed to accommodate my power chair, and my two boys had cups of water (with paper straws) waiting for them with their names on them. Our wait staff were incredibly attentive, and the food was served quickly. There are two specialty restaurants on board – Palo and Remy – but we didn’t dine at either. 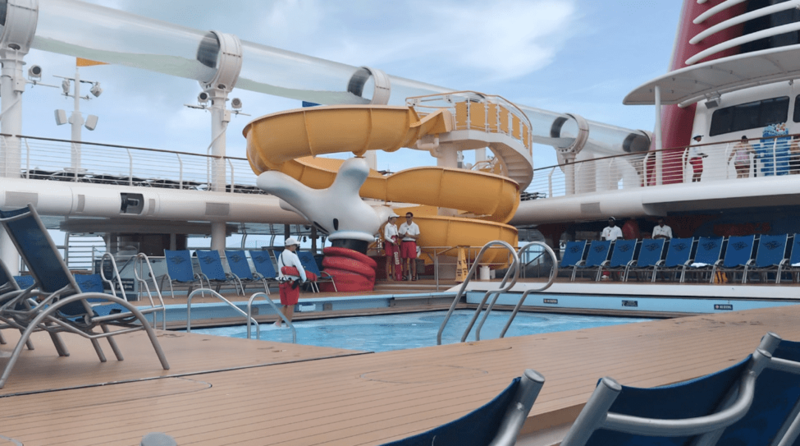 There are huge areas for the various Disney Dream youth clubs on deck five, including a nursery for the little ones, the Oceaneer Club and Oceaneer Lab for adolescents, Edge for tweens, and Vibe for older teenagers. I visited the Oceaneer Lab during a port call when it was mostly empty, and I saw that there were SO many cool things for kids to do! It’s no wonder I didn’t see my children for hours at a time while we were at sea. From what I saw, there would have been plenty of space for a child in a wheelchair to maneuver and engage in various activities. 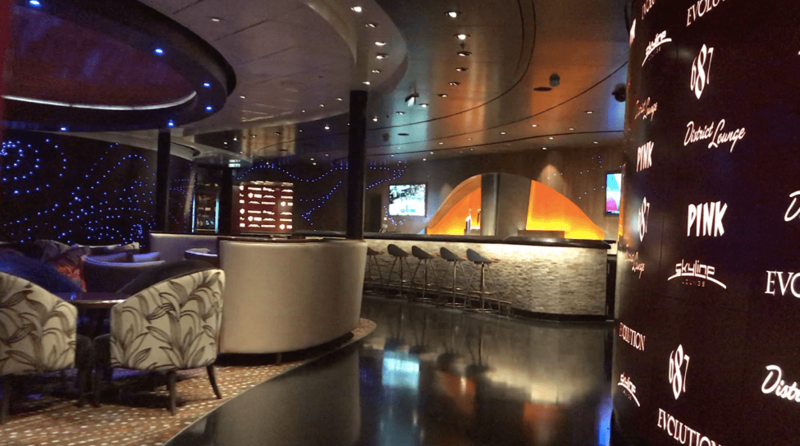 There are several bars, lounges, and clubs in the aft section of deck four that are only for adults. The area is called The District, and includes dance clubs, live music venues, a pub, and even a champagne room. I didn’t spend any time there at night, but did participate in two trivia sessions and a game show during the day. The space between seats in both Pub 687 and Evolution was very tight, and that was without people in either venue. For wheelchair users, The District may be quite difficult to maneuver through during busy times at night, and especially during events like 18+ game shows. The Disney Dream is a beautiful ship with tastefully decorated and extremely clean and well-maintained public areas. The main thoroughfares are wide, and the only thresholds I had to be careful crossing were the ones on deck eleven leading from the central elevators to the pool area. My parents are in their 80s and need to rest pretty often, so I noticed that there is a distinct lack of seating in public areas. There are two main pools on deck eleven: the Donald pool for smaller children, and the Mickey pool for older kids and adults. There is a yellow corkscrew waterslide and the roller coaster-like Aquaduck water ride that circles deck twelve in a clear tube. There is also an adults-only pool in a separate area called The Cove. There is a pool lift available by request (with at least an hour’s advance notice required), but it can only be installed by the adult pool and jacuzzi. There are also a few steps leading up to the main pools, so it won’t be possible for many wheelchair users to swim with their kids. The good news is that there is designated wheelchair seating on the pool deck for shows and events, like the fireworks on Pirate night. There is also easy access to the poolside food offerings like burgers and pizza, unlimited sodas, and unlimited soft-serve ice cream. The atrium is in the center of the ship on deck three, and there are character meet-and-greets and live music going on here while the ship is at sea and every evening. It can get pretty crowded, so wheelchair users need to be careful not to crash into smaller children who are dancing, running, or playing. If your companions need to sit down while watching the entertainment or waiting in the area, you need to arrive early as there are very few places to sit near the live entertainment. There is more seating on deck four on the port side where you can still hear the music below. 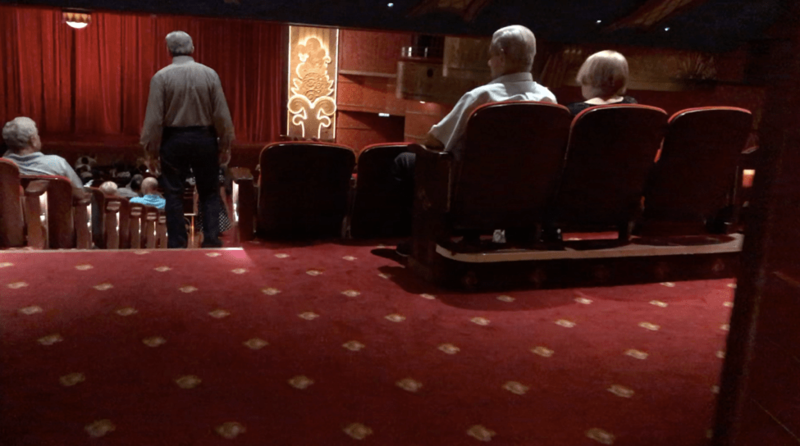 There is a movie theater on deck three that shows Disney movies throughout the entire cruise, including movies currently showing in theaters in the US. The main live performance venue is the Walt Disney Theater, which puts on Broadway-style shows each night. 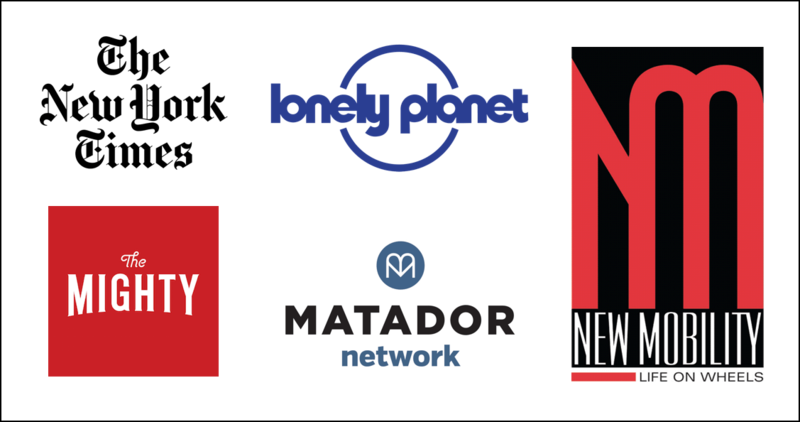 I can’t emphasize enough how incredibly good these shows are! Definitely Disney quality, with sets and special effects that are jaw-dropping. The caliber of the singers and dancers is on par with anything you’ll find in a stage show in the US. There is accessible seating for wheelchair users and their companions at the top of the lower theater section on deck three. However, the balcony overhead does block your view of the very top of the stage and part of the two screens on either side of the stage. You have the option to take a special elevator to the bottom of the theater to reach accessible seating in the front row. Personally, I don’t like that area because I get a sore neck from looking up at the stage for an hour, but you may have a different preference. The Disney Dream stops on every Bahamas itinerary at Castaway Cay (pronounced “key”), Disney’s private island. It’s one of the very rare cruise ship private island ports of call where the ship actually docks, which means wheelchair users can just roll off the ship without having to worry about tendering. Castaway Cay is basically one very long beach with lots of water activities and a water slide area for kids. When you get off the ship, you can either walk/roll to the beach area or take the tram (similar to the parking lot trams at Walt Disney World). The trams are accessible, but as of May 2018, they will only take manual wheelchair users due to some past mishaps with power chairs and associated damage. The boardwalk leading to the main part of the Cay is paved and mostly pretty wide, with just a few narrower spots. The boardwalk is also lined with open-air shops, bars, dining options, and covered pavilions for eating or relaxing. The Cay also has Scuttle’s Cove, which is where the Oceaneer Club and other youth clubs move their kids’ activities while in port. There are roughly a dozen beach wheelchairs available for free on a first-come, first-served basis, so I would recommend arriving at the beach early if you need one. There is flat access to the sand from the paved boardwalk and tons of shaded areas and lounge seating for everyone else. There are accessible restrooms throughout the Cay, although I didn’t make note if they had changing beds. 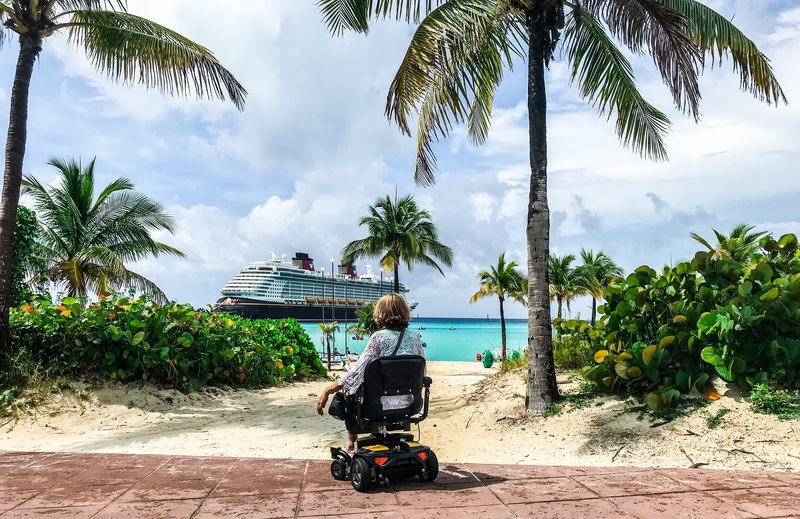 Are you ready to book your wheelchair accessible cruise on the Disney Dream to the Bahamas? 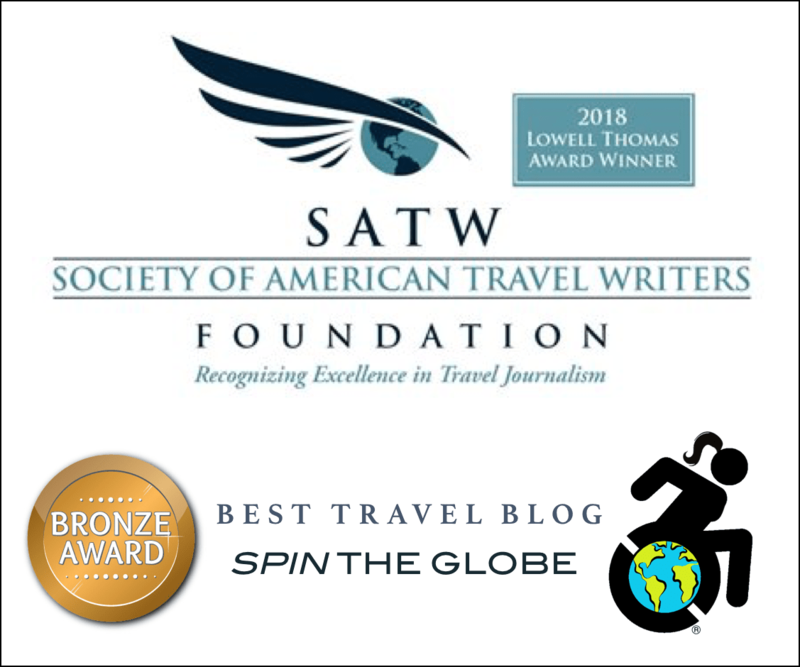 Contact me at Spin the Globe/Travel and we can start working that Disney magic! This was helpful. I am planning our cruise with my wheelchair-bound son on the Dream, and I appreciate your detail!